A bog garden can be a beautiful and exciting way to display your plants and landscape your home. You my have the mixed blessing of a low area that remains wet throughout the year that is custom made for a bog garden. If not, many variations exist in design and construction. Here's how to create, plant and maintain a bog garden. Choose a sunny spot that gets five or more hours of full sun, and can be made mostly level. The main viewing area (path) should be from the south side. You can use rope or garden hose to mark an outline which will be the perimeter of the bog. Leave a 6-8 foot space on the north side of this bog if you plan on using large background plants such as Iris pseudacorus, Hibiscus coccineus, etc. Large plants must not shade out the bog. Bog gardens also can be placed along the edge of a water garden. This design, especially good for Pitcher Plants (Sarracenia), hardy Sundews (Drosera), and the Venus's Flytrap (Dionaea), is intended for outdoor use in USDA zones 6 and warmer. Other plants that enjoy this system include hardy bog orchids (Calopogon, Pogonia, others), Bog Buttons (Marshallia), Bog Gentians, Lobelia, Sabatia, Orange Milkwort (Polygala lutea), and many other bog plants. Adaptations in plant species and winter coverings may increase the range where this design is useful. Cranberries are not recommended as they grow too aggressively! 1. Dig the outlined bog to a depth of 12-14 inches, removing soil to form a basin. The bottom should be mostly flat, level or slightly pitched. The sides should go mostly straight down. 2. If moles or tunneling rodents are a problem in your area, line the basin with galvanized hardware cloth, screening, or heavy, woven weed cloth/barrier. Use rot/rust resistant materials. 3. Line the bottom and sides of the basin with 4-6 mil plastic sheeting (on top of any mole/ rodent protection.) Leave plenty of excess plastic along the edges; it can be trimmed away after the bog is filled and settled. Cut several ten-inch slits in the liner base, every foot or so. This will allow the bog to drain, while the liner holds most of the moisture in the bog. 4. Add 2-3 inches of moist sand to the bottom. Coarse sands are good to use. Do not use beach sand! 5. Fill the remaining basin with: 1 part sand + 3 parts peat moss, dampened and mixed well. Tamp the mix in place using a bow rake; this will reduce settling of the mix. The bog should be filled until it is about an inch below surrounding, existing, soil level. 6. The lining materials can be trimmed as needed. It is wise to leave about 12 inches of liner/mammal guard exposed in case the bog settles further; this edge can be hidden with mulch, pine needles, rocks, etc. 7. Paths of rough stones or bricks should be made through the bog, and over these should be placed flat stepping stones, in order to make every part of the bog accessible. If these paths are made at varying heights, they may be used to divide the bog into shelving beds, the higher and better-drained of which will accommodate plants not requiring too much moisture, while in the lower-lying sites can be for the real moisture-lovers. During construction of a pond, minimize the use of shelves for potted plants and instead, build planting pockets for bog plants right into the edges of the pond. Size of the planting areas can vary greatly, from a tiny sliver of space to large planting zones. You just need a way to hold back the soil from washing away into the pond. The diagram at left illustrates an example of a bog gardening area with a deeper depth for moisture loving plants and shallower one for bog plants that need to be a bit higher and dryer. 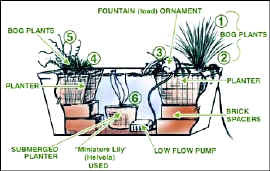 The diagram at right shows how to set up a bog as a container garden. Normally, there won't be much to do but to remove any leaf debris left from the fall or that has blown in over the winter. Be sure to replant any plants that have heaved from ground freezing and thawing over the winter. Constant saturation is not needed, but the soil mix should not dry out. Try soaker hoses, buried three inches below the surface and about two feet apart, to deliver efficient irrigation. Gentle hand watering is an option. Five-day watering intervals are typical, depending on weather. Unless a natural flow of water is available, you need to provide an artificial trickle, just sufficient to keep the bog swampy. If required in the summer, turn the hose on and let the bog flood. A mulch 6 inches deep of pine needles or oak leaves is wise in zone 6 and colder parts of zone 7. This mulch should be added about December to late February, then removed once temperatures are above 32� F. If plants are pushed out of the soil by ice, replant immediately. Dead leaves can be trimmed off about two inches above soil level. Do not fertilize! Feeding insects to carnivorous plants is not needed outdoors. Enjoy the show! New growth will begin very quickly if planted properly (see Planting a Bog Garden). The leaves that were present on the plant when shipped to you or when you bought it will often die soon after planting and will be replaced by new foliage. Protect from sun if necessary for a day or two with a layer of lightweight cloth. Once growth is underway; the plants require normal maintenance like any other perennial. Keep dead or dying leaves pinched off for the best appearance. Remove dead flowers to prevent seed production and to boost continued blooming on most varieties. You will have to follow the stems of dead leaves or flower stalks on deeper-water bog plants down to the soil level to remove them. As the fall season winds down, the leaves die off at a faster rate than they are being produced. Consequently, leaves are being removed for maintenance faster than new ones grow. The plants will slowly become thinner with less foliage until there is none left. Sometimes it is preferable to leave some dying leaves to dry for winter texture and foliage effect. Like other herbaceous perennials the leaves and stems should be pretty well gone as winter sets in. If the plants are planted directly in a bog area, they should be left alone except to clean up any dead foliage. Plants that are in pots around ledges on your pond can be lowered to the deeper water if desired, but must be brought back up in late winter before any growth occurs. Most plants tolerate being left in place without moving them at all (in Zone 6 or warmer). 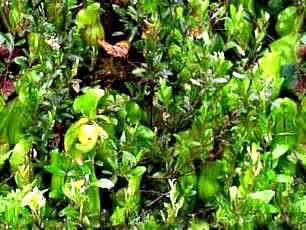 All dead growth must be removed if the plant is to be lowered under the water.